The South is home to some truly incredible history. Historic sites can be found all around Savannah, Georgia, including in our very own historic district where our inn is located. If you’re looking to step back into the past, consider visiting somewhere like the Rose Hill Plantation House. Located just 45 minutes away from Presidents’ Quarters Inn, a drive to Bluffton, South Carolina, will make the perfect day trip during your stay! Do you want to know more of our favorite historic sites like Rose Hill Plantation House? Take a look at our complimentary Vacation Guide! We know that planning a trip can be challenging and time-consuming, so we created this free guide to save you from hours of research. In it, you’ll find the best restaurants, activities, popular events, and more! Bluffton, South Carolina, is one of the South’s hidden gems. In it, you’ll find the beautiful Rose Hill Plantation House! This home was originally built in the late 1850s and has lasted through the Civil War, a terrible fire, and unfortunate years of neglect. Now set back in a private community, this landmark has been completely renovated by its new owners. It is now technically a private residence, but the first floor and grounds are open to the public! If you want to see the Rose Hill Plantation House for yourself, you’ll have to schedule a tour. You’ll have the opportunity to see stunning views and experience its rich history Monday through Friday at 2:00 p.m. See the gorgeous architecture, learn about its past, and hear all about the journey of the current owners. At the end of the hour-long tour, you’ll get to enjoy refreshments in the grand dining room. All you have to do is purchase a ticket in advance to secure your reservation! Are you planning an event but haven’t chosen the perfect venue yet? Consider the Rose Hill Plantation House! This gorgeous property is available for anything from family reunions to weddings! 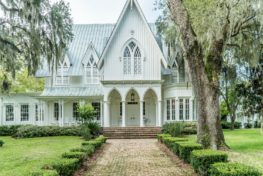 Tie the knot under Spanish moss on this historic property or make memories when you throw a party. Keep in mind that Presidents’ Quarters Inn is only 45 minutes away, so it’s the perfect place for guests or even your honeymoon! 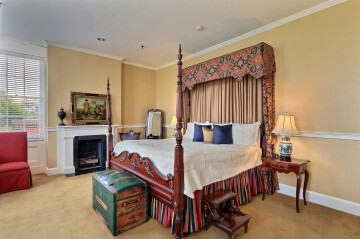 Stay in Our Historic Bed and Breakfast! Presidents’ Quarters Inn was originally built in 1855 and has a unique history of its own. Since its construction, our property has seen thousands of incredible guests, one of the most famous being Civil War General Robert E. Lee! Now, you can visit our cozy bed and breakfast for yourself. Each of our comfortable accommodations has been named after U.S. Presidents who visited Savannah to keep with its historic theme. You’ll love our outstanding amenities including a delicious breakfast that put us a step above other big-name hotels. Browse our rooms and suites, then book your stay! Adventures like visiting the Rose Hill Plantation House await! Presidents’ Quarters Inn has been given permission to use these photos courtesy of Rose Hill Mansion.